As we pray in the Spirit, we tap into the mind of God. This seems totally contrary to the natural mind with its logic and reasoning. But, here again, Paul sheds much light on this topic. “But the natural man does not receive the things of the Spirit of God, for they are foolishness to him; nor can he know them, because they are spiritually discerned. But he who is spiritual judges all things, yet he himself is rightly judged by no one. For ‘who has known the mind of the Lord that he may instruct Him?’ But we have the mind of Christ” (1 Corinthians 2:14-16, NKJV). How is it that Paul can make this arrogant sounding claim: But we have the mind of Christ”? Interestingly, Paul was not making this claim only for himself, hence he uses the plural “we.” Who are these people who have the mind of Christ? From the above passage we can see it is “he who is spiritual.” By extension, we can rightly conclude that it is the man or woman who has received the Spirit of God. It is the man or woman who prays in the Spirit of God. It is the man or woman who prays in the Spirit according to the Spirit, “… because He (the Holy Spirit) makes intercession for the saints according to the will of God” (Romans 8:27b). It is well worth noting that Paul was writing these words to a Spirit-filled, tongue-talking church. In fact, every New Testament writer was a tongue-talking, Holy Spirit baptized believer. The New Testament church was Pentecostal in faith and experience. They lived and breathed the Spirit. That is why the miracle-working power of God was present among them. The greatest stumbling block to speaking in tongues is that it is not understood, which is why it is frequently shunned or mocked by believers and unbelievers alike. Paul makes this incomprehensibility perfectly clear when he states: “For if I pray in a tongue, my spirit prays, but my understanding is unfruitful” (1 Corinthians 14:14). This lack of understanding often acts as a deterrent for tongue talkers as well. Our natural mind reasons that since I do not understand what I am praying when I speak in tongues, this exercise must be useless. That is precisely what the devil would like us to believe. That is precisely the reasoning of the natural man. All this speaking in tongues is entirely foolishness to the natural man. But the spiritual man operates on a completely different plane. He functions in the realm of faith—a faith that transcends human reason. Notice Paul’s response to the problem of the incomprehensibility of tongues. Does he say, “It is useless. I cannot understand it. Shut it down”? On the contrary, he gives the following advice: “What is the conclusion then? I will pray with the spirit, and I will also pray with the understanding. I will sing with the spirit, and I will also sing with the understanding” (1 Corinthians 14:15). Paul advocates both praying in tongues, that is “with the spirit,” and praying “with the understanding,” which, in our case, means praying in English. He then goes one step further by adding his ringing endorsement of speaking in tongues as a language of prayer: “I thank my God I speak with tongues more than you all” (1 Corinthians 14:18). Excerpt taken from: Tunks on Tongues by George Tunks (with David Kitz). 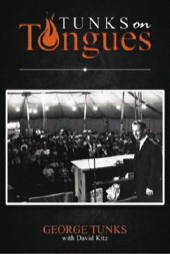 Tunks on Tongues is available by contacting Wordcom Christian Resources at wordcom@paoc.org or (905) 542-7400, ext. 4248. Price is $17.95 Canadian (plus shipping and tax).